Activate the Scripted lite and Click on “Customize” in the Appearance Menu in the Dashboard. To edit the content of theme. Copy the files inside "scripted-lite" folder from the zip file of the latest version of Scripted Lite Theme. Add or change the content here to change the heading of home page. 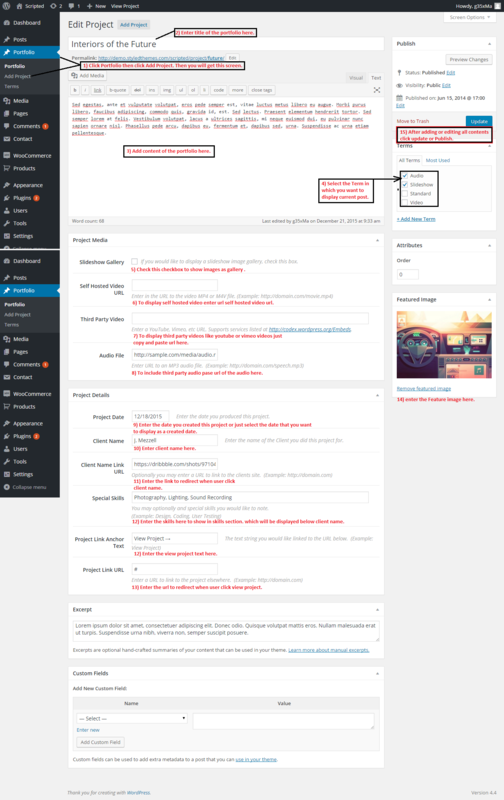 appearance > customize > Home page > Left Text Columns to change or add text in left. appearance > customize > Home page > Center Text Columns to change or add text in Center. appearance > customize > Home page > Right Text Columns to change or add text in Right. appearance> Customizer > General setting > upload custom logo. Then upload logo to change in header. Enter the feedburn url which shows your url feeds. First install the fontact form 7 plugin. Then copy and paste the contact form shortcode to view the contact from. Insert the site analysis code here. appearance> Customizer > General setting > upload favicon. Upload favicon of your choice here if you leave it empty default faviocn of theme is loaded. Enter the header right icon here. Check this checkbox to view Site title as header and hide header image. In this tutorial, we will be guiding to the page templates that Scripted Lite provides. Default Template This template is default and it shows full content along with content. Sidebat Template This template shows content with right sidebar. Contact This Templates Displays full content of contact us page. Portfolio This Templates Displays all the posts posted under portfolio posty type. Terms they are posted in. Home page This template displays the full width home page view. Go to Appearance > Customizer > Styles > Link & Accent Color. Then choose to color of your choice to implement in all the link in theme. Enter the custom css here to change the style of the site. Create your static page and select home template for Home page add use it as front page. Change or edit footer text here. NOTE: This feature is only available in the premium version. select portfolio > add new. then input data for portfolio. Select Dashboard > Appearance > Menus. 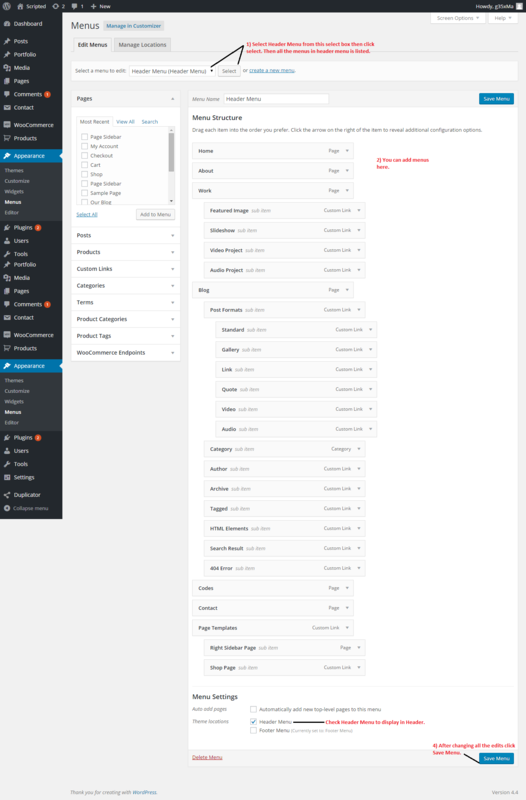 It is same process as header menu instead of selecting Header Menu select "Footer Menu" to display in footer. Select Dashboard > Appearance > Widgets. Add widgets in sidebar widget area do display in bottom content which will display after clicking header right icon. Add widgets in sidebar widget area do display in right sidebar. Add widgets in sidebar widget area do display in Shop sidebar.